We look forward to another wonderful year of fellowshipping with you and the other saints who love the gospel of the grace of God and the Word of God rightly divided (Acts 20:24, 2 Tim. 2:15). June 16-20, 2019 will be the 51st Annual Berean Bible Fellowship Conference. We will be meeting at Community Bible Church, 1427 W. Main Street, in Tipp City, Ohio. In fifteen messages, the Conference speakers will take us through the first eight chapters of the book of Acts with the theme “Israel’s Fleeting Opportunity”. In addition, the Bible Hour speaker will be Mr. David Stewart of Faith Bible Church of Steger, Illinois, whose Bible teaching we have enjoyed at past conferences. His four messages will be on “Beneath The Surface—Comprehensive Bible Types”. Please pray that God uses the conference to change hearts and lives for His glory. Pray for the speakers, the teachers, the helpers, musicians, and the many volunteers. May everyone who attends be used and be blessed in a special way. Encourage someone to attend, if only for a day or two. Sitting under God’s Word and fellowship with brothers and sisters in Christ is life changing. 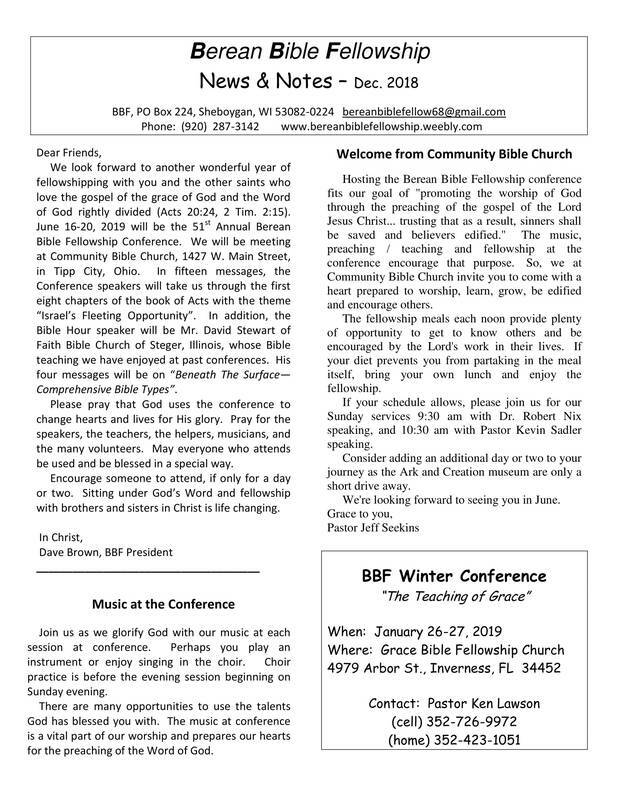 Hosting the Berean Bible Fellowship conference fits our goal of "promoting the worship of God through the preaching of the gospel of the Lord Jesus Christ... trusting that as a result, sinners shall be saved and believers edified." The music, preaching / teaching and fellowship at the conference encourage that purpose. So, we at Community Bible Church invite you to come with a heart prepared to worship, learn, grow, be edified and encourage others. The fellowship meals each noon provide plenty of opportunity to get to know others and be encouraged by the Lord's work in their lives. If your diet prevents you from partaking in the meal itself, bring your own lunch and enjoy the fellowship. If your schedule allows, please join us for our Sunday services 9:30 am with Dr. Robert Nix speaking, and 10:30 am with Pastor Kevin Sadler speaking. Consider adding an additional day or two to your journey as the Ark and Creation museum are only a short drive away. We're looking forward to seeing you in June. Join us as we glorify God with our music at each session at conference. Perhaps you play an instrument or enjoy singing in the choir. Choir practice is before the evening session beginning on Sunday evening. There are many opportunities to use the talents God has blessed you with. The music at conference is a vital part of our worship and prepares our hearts for the preaching of the Word of God. Just $6 per person per meal if prepaid by June 1, 2019. 5 years old and under are free. (Limited quantity of meals available at beginning of Conference for $7.) No refunds or exchanges. 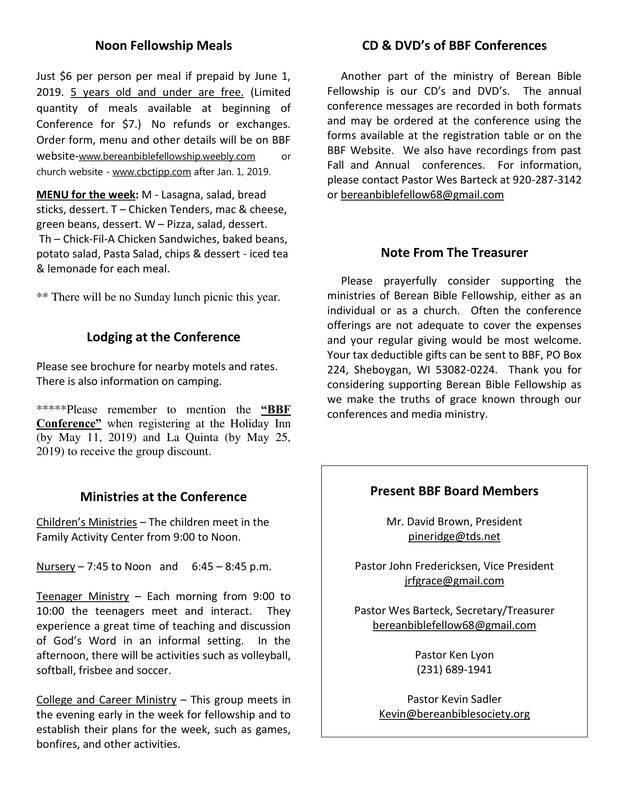 Order form, menu and other details will be on BBF website-www.bereanbiblefellowship.weebly.com/annual-summer-conference or church website - www.cbctipp.com after Jan. 1, 2019. MENU for the week: M - Lasagna, salad, bread sticks, dessert. T – Chicken Tenders, mac & cheese, green beans, dessert. W – Pizza, salad, dessert. Th – Chick-Fil-A Chicken Sandwiches, baked beans, potato salad, Pasta Salad, chips & dessert. ​(Iced tea & lemonade for each meal). ** There will be no Sunday lunch picnic this year. Please see brochure for nearby motels and rates. There is also information on camping. *****Please remember to mention the “BBF Conference” when registering at the Holiday Inn (by May 11, 2019) and La Quinta (by May 25, 2019) to receive the group discount. Children’s Ministries – The children meet in the Family Activity Center from 9:00 to Noon. Nursery – 7:45 to Noon and 6:45 – 8:45 p.m.
Teenager Ministry – Each morning from 9:00 to 10:00 the teenagers meet and interact. They experience a great time of teaching and discussion of God’s Word in an informal setting. In the afternoon, there will be activities such as volleyball, softball, frisbee and soccer. College and Career Ministry – This group meets in the evening early in the week for fellowship and to establish their plans for the week, such as games, bonfires, and other activities. Please prayerfully consider supporting the ministries of Berean Bible Fellowship, either as an individual or as a church. Often the conference offerings are not adequate to cover the expenses and your regular giving would be most welcome. Your tax deductible gifts can be sent to BBF, PO Box 224, Sheboygan, WI 53082-0224. Thank you for considering supporting Berean Bible Fellowship as we make the truths of grace known through our conferences and media ministry. Like BBF on Facebook to receive news and updates!